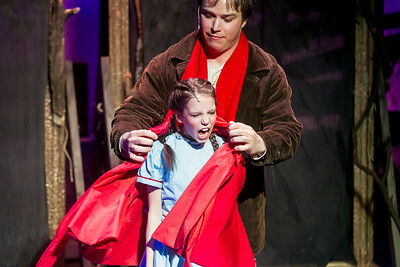 Sarah Nader- snader@shawmedia.com Tori Whaples, who portrays Little Red Riding Hood, and Colin May, who portrays the baker, perform a scene during Thursday's dress rehearsal for the Woodstock Musical Theatre Company's production of "Into the Woods" at the Woodstock Opera House April 7, 2016. Performance dates include Friday's April 8, 15 and 22 at 8p.m Saturdays April 9, 16, 23 at 8pm and Sundays April 10, 17 and 24 at 3pm Tickets are $24.00 for adults, $21.00 for students and $21.00 for seniors. 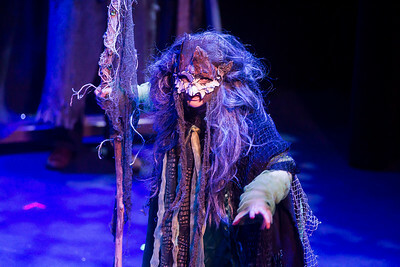 Sarah Nader- snader@shawmedia.com Jenny Bakakos, who portrays the witch, performs a scene during Thursday's dress rehearsal for the Woodstock Musical Theatre Company's production of "Into the Woods" at the Woodstock Opera House April 7, 2016. Performance dates include Friday's April 8, 15 and 22 at 8p.m Saturdays April 9, 16, 23 at 8pm and Sundays April 10, 17 and 24 at 3pm Tickets are $24.00 for adults, $21.00 for students and $21.00 for seniors. 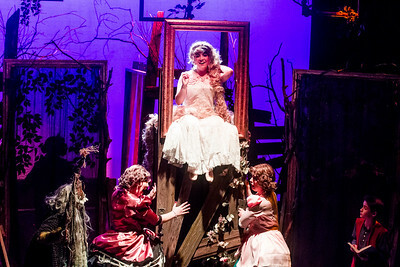 Sarah Nader- snader@shawmedia.com Jane Charlotte, who portrays Rapunzel, performs a scene during Thursday's dress rehearsal for the Woodstock Musical Theatre Company's production of "Into the Woods" at the Woodstock Opera House April 7, 2016. Performance dates include Friday's April 8, 15 and 22 at 8p.m Saturdays April 9, 16, 23 at 8pm and Sundays April 10, 17 and 24 at 3pm Tickets are $24.00 for adults, $21.00 for students and $21.00 for seniors. 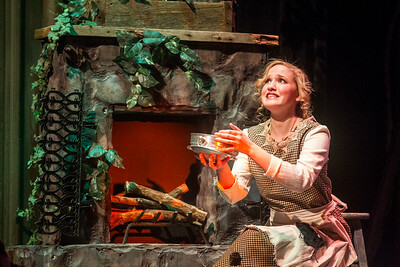 Sarah Nader- snader@shawmedia.com Jillian Mayer, who portrays the baker's wife, performs a scene during Thursday's dress rehearsal for the Woodstock Musical Theatre Company's production of "Into the Woods" at the Woodstock Opera House April 7, 2016. Performance dates include Friday's April 8, 15 and 22 at 8p.m Saturdays April 9, 16, 23 at 8pm and Sundays April 10, 17 and 24 at 3pm Tickets are $24.00 for adults, $21.00 for students and $21.00 for seniors. 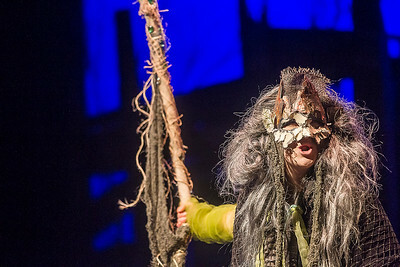 Sarah Nader- snader@shawmedia.com Katie Kallaus, who portrays Cinderella, performs a scene during Thursday's dress rehearsal for the Woodstock Musical Theatre Company's production of "Into the Woods" at the Woodstock Opera House April 7, 2016. Performance dates include Friday's April 8, 15 and 22 at 8p.m Saturdays April 9, 16, 23 at 8pm and Sundays April 10, 17 and 24 at 3pm Tickets are $24.00 for adults, $21.00 for students and $21.00 for seniors. 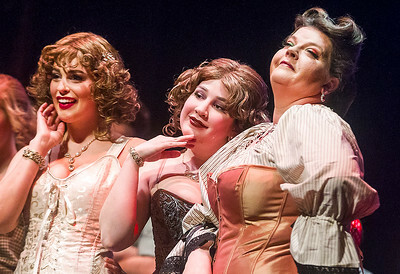 Sarah Nader- snader@shawmedia.com Bridget Elmer (left) and Savannah Thomas, who portray the stepsisters, and Tracy Lanman, who portrays the stepmother, perform a scene during Thursday's dress rehearsal for the Woodstock Musical Theatre Company's production of "Into the Woods" at the Woodstock Opera House April 7, 2016. Performance dates include Friday's April 8, 15 and 22 at 8p.m Saturdays April 9, 16, 23 at 8pm and Sundays April 10, 17 and 24 at 3pm Tickets are $24.00 for adults, $21.00 for students and $21.00 for seniors. 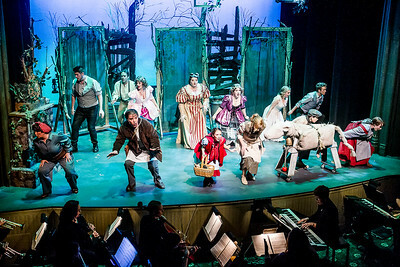 Sarah Nader- snader@shawmedia.com The cast performs a scene during Thursday's dress rehearsal for the Woodstock Musical Theatre Company's production of "Into the Woods" at the Woodstock Opera House April 7, 2016. Performance dates include Friday's April 8, 15 and 22 at 8p.m Saturdays April 9, 16, 23 at 8pm and Sundays April 10, 17 and 24 at 3pm Tickets are $24.00 for adults, $21.00 for students and $21.00 for seniors. 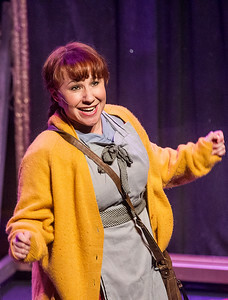 Jillian Mayer, who portrays the baker's wife, performs a scene during Thursday's dress rehearsal for the Woodstock Musical Theatre Company's production of "Into the Woods" at the Woodstock Opera House April 7, 2016. Performance dates include Friday's April 8, 15 and 22 at 8p.m Saturdays April 9, 16, 23 at 8pm and Sundays April 10, 17 and 24 at 3pm Tickets are $24.00 for adults, $21.00 for students and $21.00 for seniors.